SymbioSEAS represents the efforts of scientists and staff at the Hawaiʻi Institute of Marine Biology working with community artists and organizers over the past year to bring global awareness to the health & rehabilitation of our oceans and coral reef through cultivation of a gallery that showcases coral ecosystems research through various 2-D and 3-D mediums. 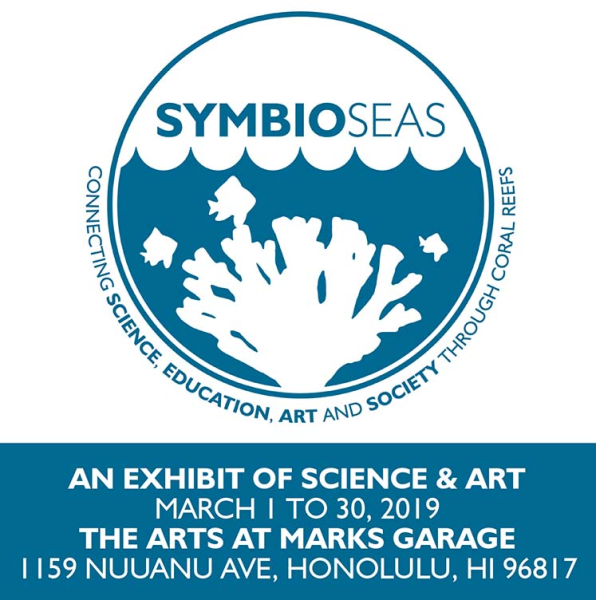 SymbioSEAS is being held in honor of Dr. Ruth Gates and is partially funded by the Western Society of Naturalists Rafe Sagarin Fund for Innovative Ecology and the HIMB MakerLab (with support from the National Science Foundation). A variety of public programs will accompany the gallery, including science and art workshops, community dinners, film screenings, and more. 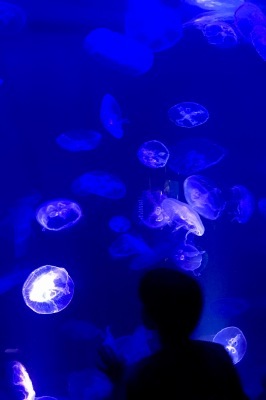 Join us for the SymbioSEAS gallery opening on March 1st from 6-9pm! First Friday festivities will include a docent tour of the gallery and live musical performances. 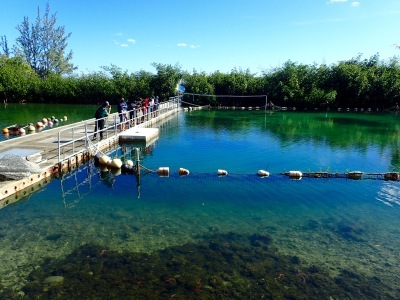 Come see work by Gates Coral Lab former post-doc/graduate student Dr. John Burns and graduate students Chris Wall, Beth Lenz, Shayle Matsuda, and Mariana Rocha de Souza! 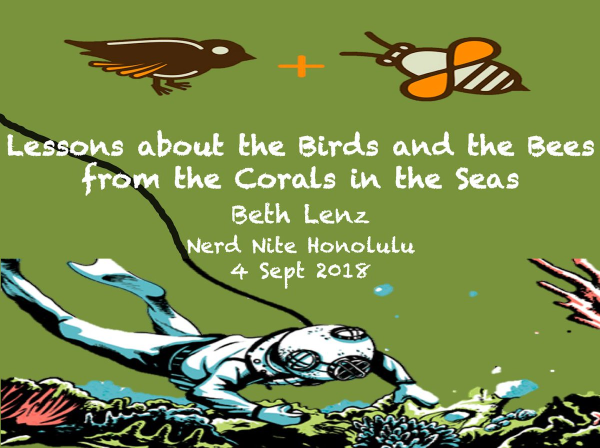 PhD candidate Beth Lenz gave a public talk about her research on coral sexual reproduction at Nerd Nite Honolulu hosted at the Irish pub, Anna O'Brien's. 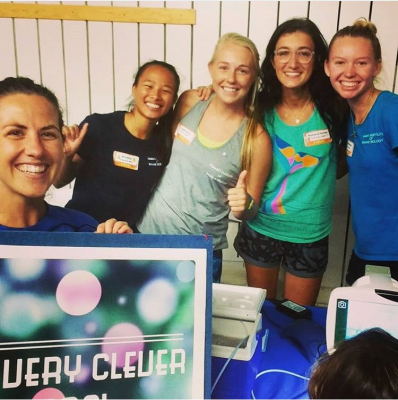 PhD Candidate Beth Lenz and Gates Coral Lab interns Nina Bean, Casey Harris, Madeline Piscetta, Adam Helbig, Megan Buras, and Dyson Chee had a blast at the Waikiki Aquarium Family Night: The Living Reef! We shared our research that develops techniques to better understand resilience in coral future reefs. 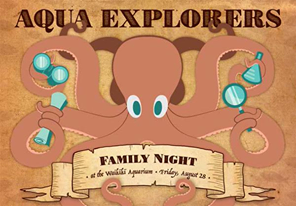 Watch out for the next Waikiki Aquarium Family Night next year! 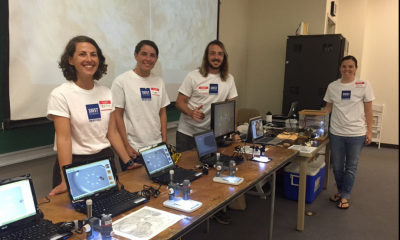 Members of the Gates Lab hosted four outreach workshops in April! 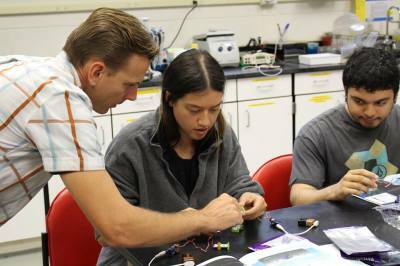 This included pre-service teachers building spectrophotometers (NSF EAGER at Hawai'i Institute of Marine Biology - HIMB MakerLab). 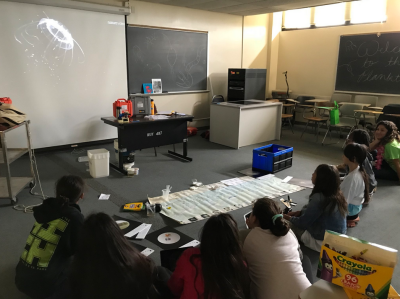 We also engaged middle school girls in STEM by investigating "Super Corals & Their Buddies" (Tech Savvy Conference) as well as having a “Plankton Party” and playing “Reef Tetris” (Expanding Your Horizons). We had a blast! 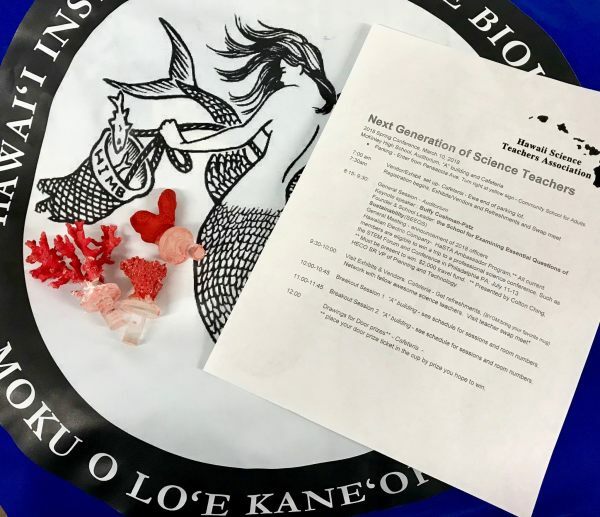 We had some great feedback from teachers about our new coral bleaching activity at the 2018 Hawaii Science Teachers Association (HaSTA) conference! PhD student in the Gates Lab, Mariana Rocha de Souza skyped with a 5th grade class from Crest View Elementary, MN through the Skype a Scientist program. 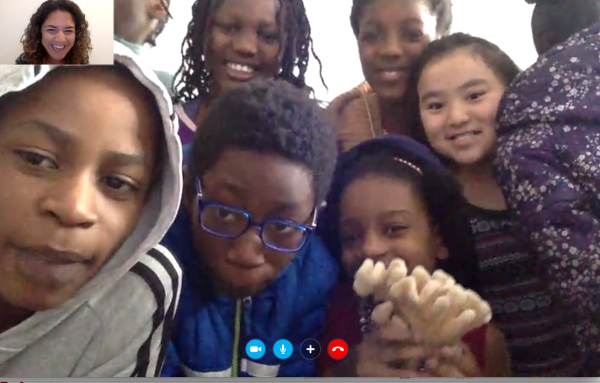 Students watched the film Chasing Coral before Skyping with Mariana and then asked her questions about coral bleaching, growth, and health! 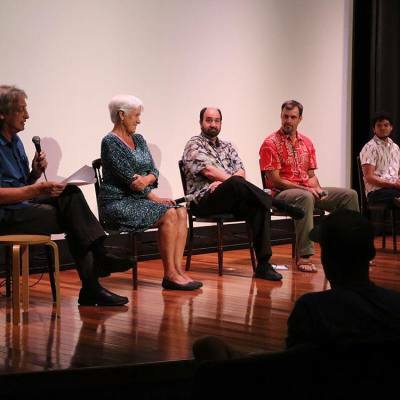 PhD candidate in the Gates Lab, Ariana Huffmyer, participated in a panel discussion following the screening of the film, Chasing Coral at Kapiolani Community College in Honolulu. After the film, panelists and students had a great discussion on coral reefs, the threats they face, and ways to help the reef! 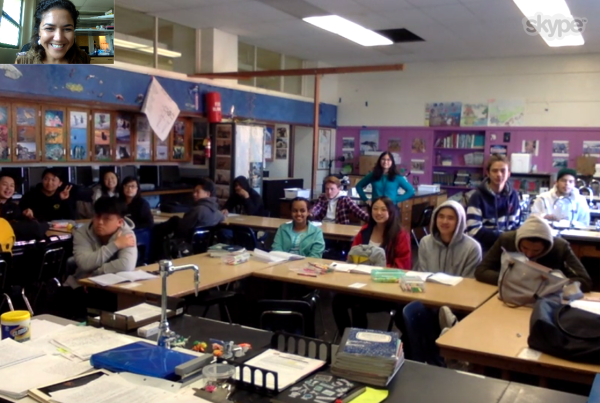 PhD student in the Gates Lab, Mariana Rocha de Souza skyped with a class from Abraham Lincoln High School, in San Francisco, through the program, Skype A Scientist. The students watched the film Chasing Coral and talked with Mariana about paths to becoming a marine biologist and the process of graduate school. 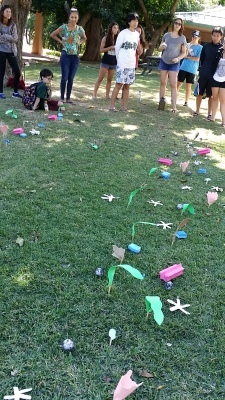 The students also disscussed threats to coral reefs and some actions each one of us can do to help save corals. We had a great visit with students from SEEQS - the School for Examining Essential Questions of Sustainability! 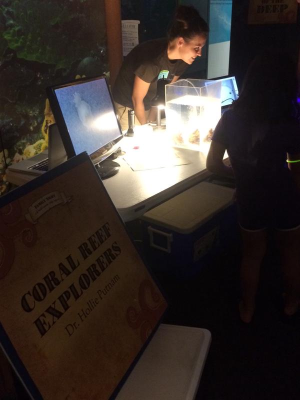 Some students visited last year and developed their own coral research projects. 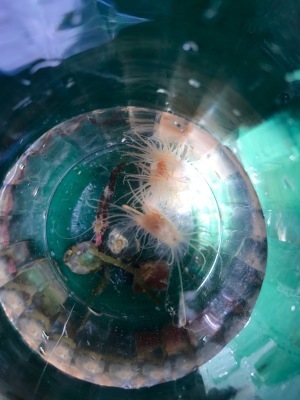 This year we incorporated new activities with a focus on how the ocean (and corals) are connected to our ahupua'a. PhD students Carlo Caruso and Ariana Huffmyer assisted in developing an outreach education activity for the 2017 Girl Scouts Stem Fest "Communicating Science to Lawmakers" table. 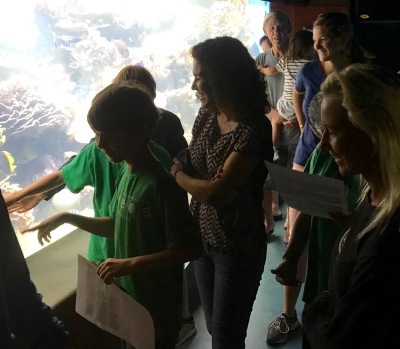 This activity led students through surveying corals during a simulated bleaching event and then practicied discussing results with a local lawmaker. 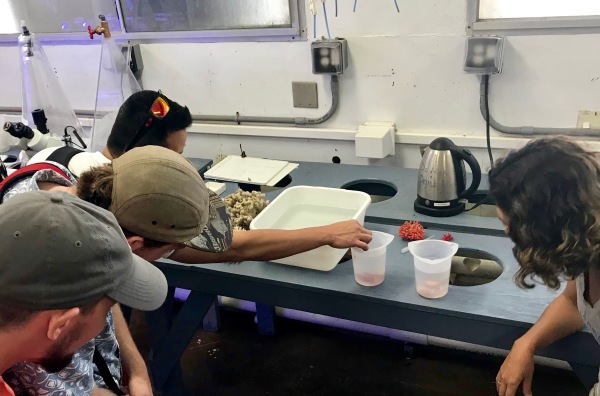 Thirteen students in a Coral Reef Ecology course at The Evergreen State College in Washington visited the Gates Lab for a tour and hands-on activities. PhD student Mariana Roucha de Souza presented and toured with the "Study Hawaii" group for the International Education Week. A group of 8 international media representatives visited to learn about educational opportunities. 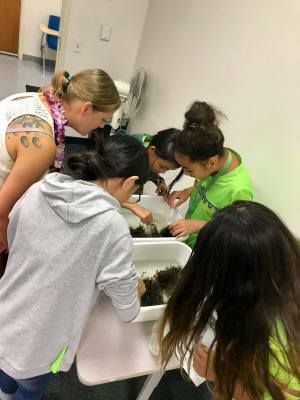 The Gates Lab and HIMB Education partnered with the STEMplus Program, Crossing Boundaries and Building Communities (a Partnership with Iolani Schools) to invite twenty-five K-12 educators from Oahu to visit HIMB. 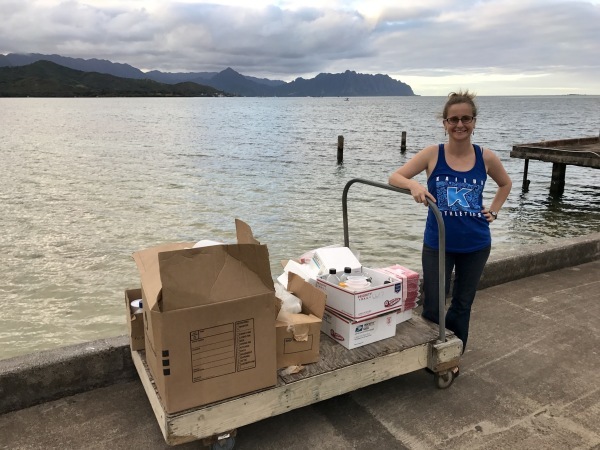 The educators and members of the Gates Lab went snorkeling in Kaneohe Bay, toured HIMB, and participated in a hands-on diersity lab. 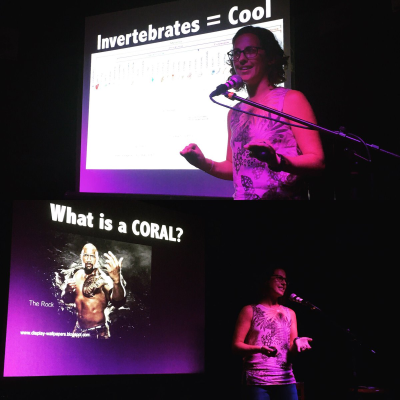 The Gates Lab attended the SOEST Open House (Oct 20 and 21) to teach our community about what coral are, why they are important, and what are current threats to our reefs! 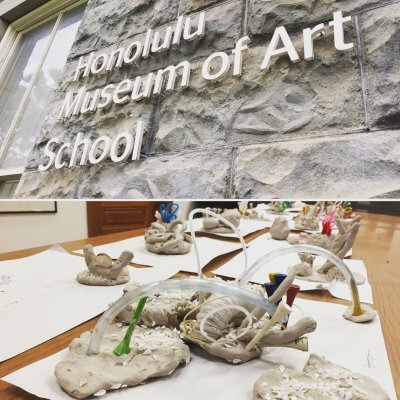 We are using various tools to engage our visitors including a virtual reality tour of Kaneohe Bay during a Bleaching event (thanks to the Google Expedition App, Caitlin Seaview, and google cardboard), 360 views of reefs on the Big Island (coraloha.com), a demo on different thermal tolerance in common coral species, and our "Save the Reef" artist corner! 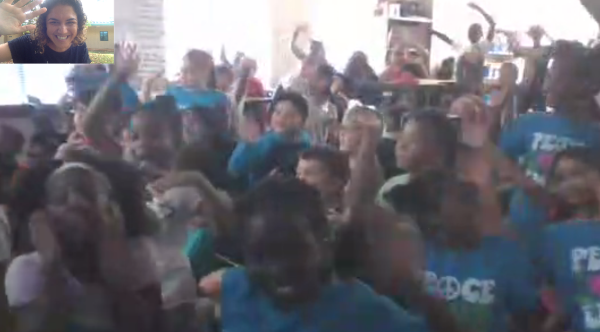 PhD student Mariana Rocha De Souza participated in the Skype a Scientist program with the 3rd grade class at Emery Elementary CFISD in Harris County, Texas. She spoke with the students about coral reefs and her experience as a scientist. The students had a lot of fun, were very excited and asked many great questions! We joined over 500 local community members at 3 exciting events! The End Game ( Hawaii Shorts International Film Festival at Waikiki Aquarium). 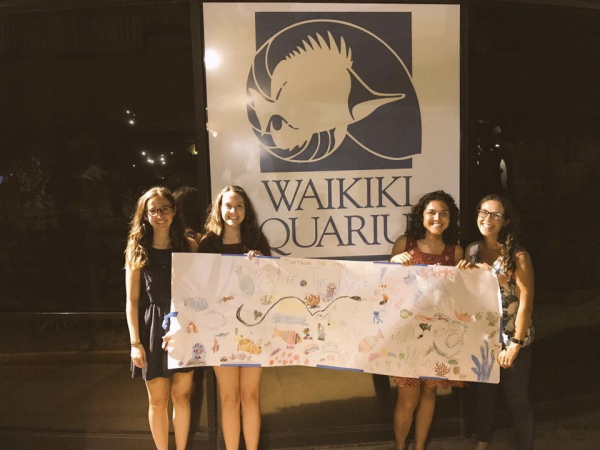 Katie Allen, Katrina McPherson, Mariana Rocha de Souza, and Beth Lenz with drawings from visitors at the Chasing Coral screening at the Waikiki Aquarium. This communal artwork is titled: "Together We Can Save the Reef"! 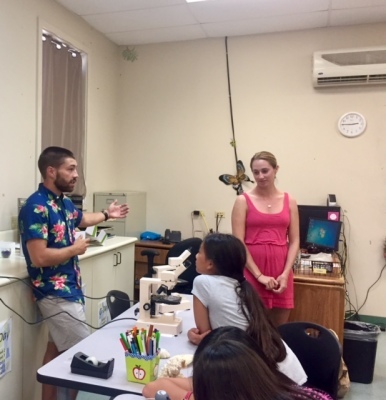 Gates Lab PhD student, Mariana Rocha de Souza and interns Caroline Hobbs and Dennis Conetta visited the Sacred Hearts Academy in Kaimuki, Oahu to talk with students about coral reefs. 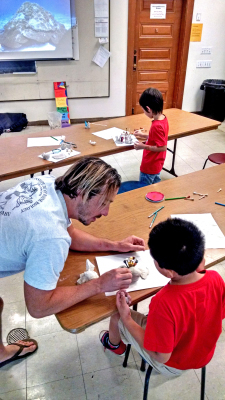 Everyone had fun learning about corals and life on reefs in Hawaii! 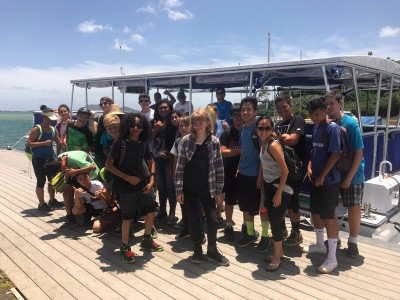 Gates Lab Members Ariana Huffmyer and Kira Hughes led 22 middle school students from Assets School in a hands-on biodiversity activity. This fun lesson was developed by Raphael Ritson-Williams (PhD Candidate) and Cristina Veresan (Teacher). 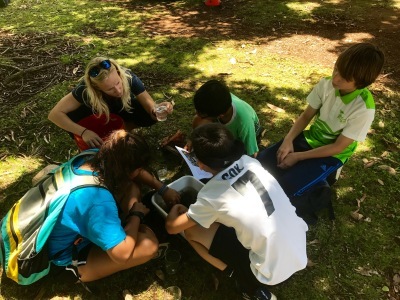 Project Manager Kira Hughes partnered with the Waikiki Aquarium and John A. Burns School of Medicine to bring the "Science of the Sting" program to ~75 Native Hawaiian high school students from Kamehameha Schools. 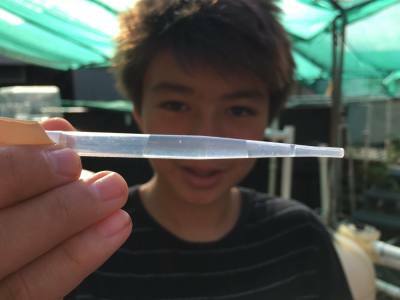 PhD Candidate Raphael Ritson-Williams had a great weekend hosting an overnight camp with 15 middle school science students at HIMB! 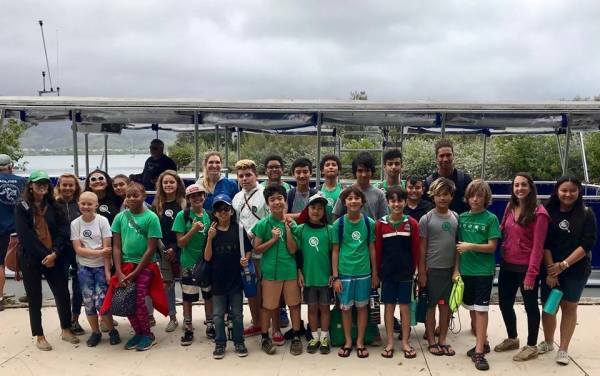 He collaborated with LeJardin Academy teacher Cristina Veresan and the HIMB Community Education Program to teach these students about quantifying coral reef diversity and coral reproduction. PhD Candidates Chris Wall and Ariana Huffmyer shared their research with students from the Pace Academy's Isdell Center for Global Leadership in Georgia. These students were selected to engage in an in-depth, year-long study about climate change and its impacts on ecosystems and societies! Kaci Muromoto, a middle school student at Mid Pacific Institute, received three awards at the Hawaii State Science & Engineering Fair including the American Chemical Society Award, best in biochemistry, and first place overall in biochemistry! She also received a nomination to the USA Science & Engineering Festival. 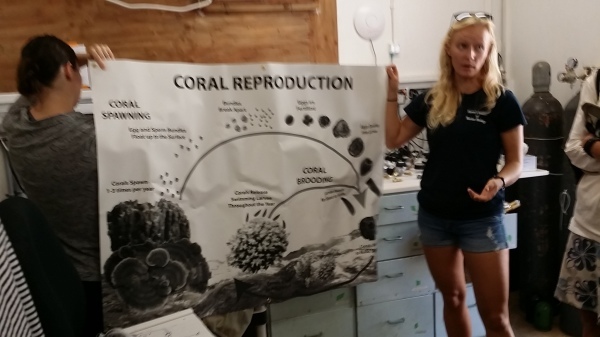 PhD Candidate Chris Wall mentored Kaci for her research on the effects of sunscreen on corals. Congratulations Kaci and Chris! BACK AGAIN! 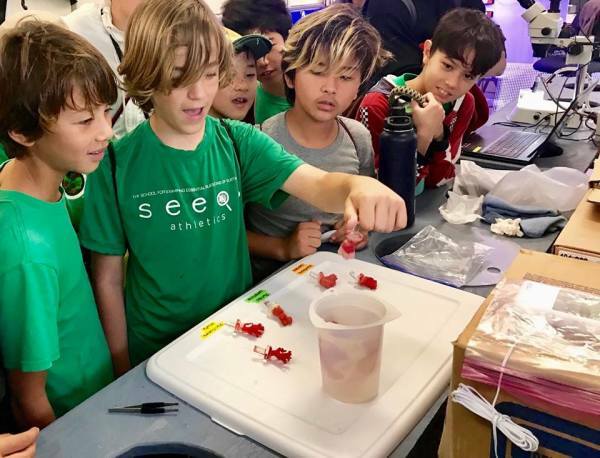 Gates lab members Chris Wall, Mariana Rocha de Souza, and Kira Hughes hosted many of the same SEEQS middle school students who visited HIMB back in September 2016 to expand their knowledge on Cnidarians in a different learning setting. 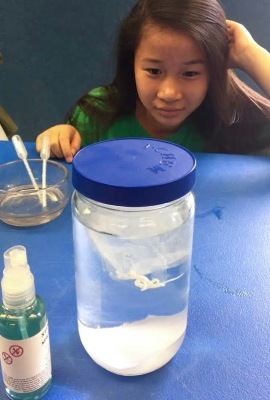 We partnered with the Waikiki Aquarium and the John A. Burns School of Medicine for the hands-on "Science of the Sting" workshop! 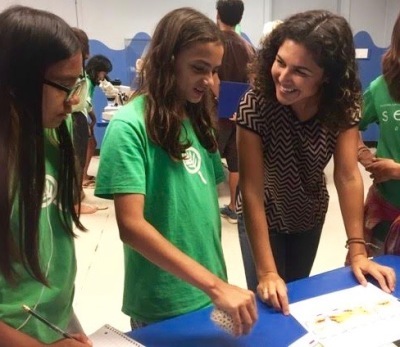 Gates lab members Mariana Rocha de Souza and Kira Hughes volunteered as judges for the Central and Windward District Science Fairs. 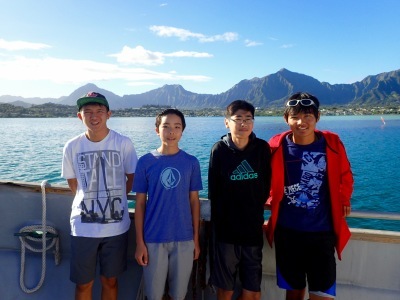 Good luck to the young scientists who advanced to the Hawai'i State Science & Engineering Fair in April! 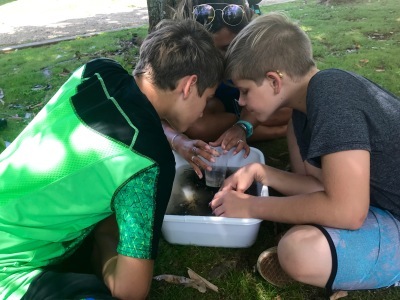 Gates Lab PhD candidate, Raphael Ritson-Williams presented a Marine Biodiversity in Limu activity to the environmental science club of 19 middle school students at Le Jardin Academy in Kailua, Hawaii. He also presented this activity to 30 middle school girls at the "Sacred Hearts Academy Symposium for Science for Girls". 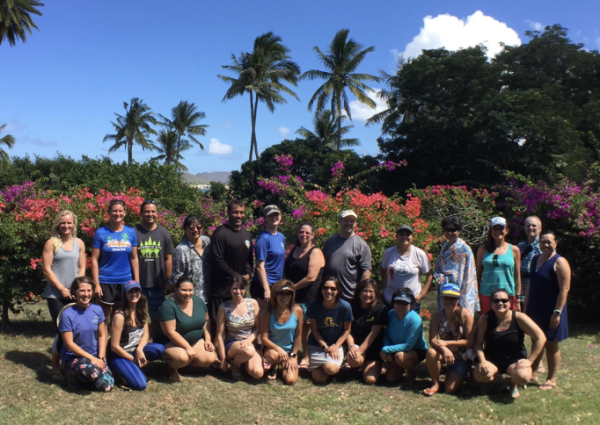 The Gates Lab welcomed a motivated group of local educators in the University of Hawaii at Manoa EDCS 433 Interdisciplinary Science Curriculum course and their professor, Dr. Pauline Chinn, to HIMB to learn more about corals and coral reefs. 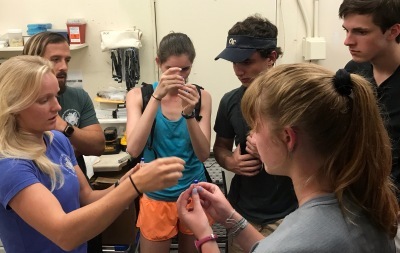 Gates Lab PhD student Mariana Rocha de Souza spent a day with 15 educators talking about place-based marine science and engaging in hands-on and minds-on activities. We enjoyed a day of great conversations and learning with this group! 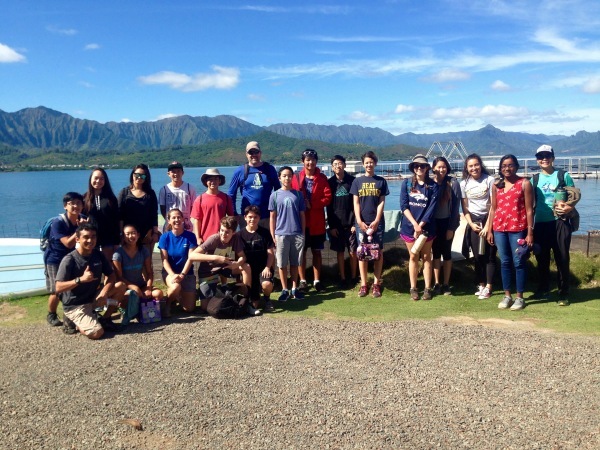 Students from Punahou School toured HIMB for the "Be a Scientist for a Day" event. Kira Hughes, Raphael Ritson-Williams, and Beth Lenz led the program. During their visit students counted coral recruiment on tiles collected from Kaneohe Bay as part of Beth's PhD research. 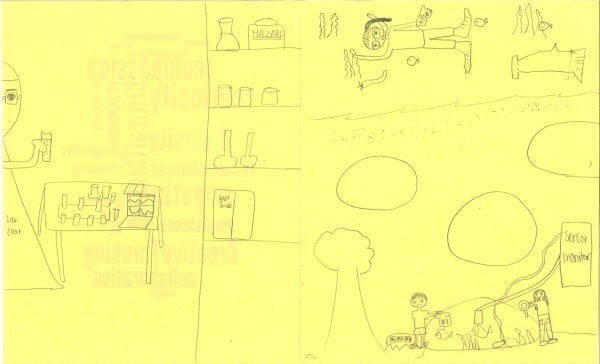 Student drawing of what a Scientist looks like before and after their Gates Lab visit. 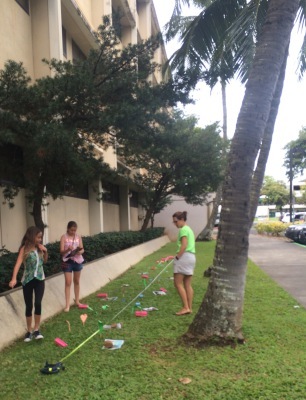 We've also been busy working with nearby Kailua High School! Three Gates Lab members volunteered as judges at their schoolwide Science Fair. We were impressed by the creativity that went into the projects! We also donated lab supplies to Sara Anglin, Science Fair Coordinator and AP Biology teacher, to be used for future instruction and student projects. 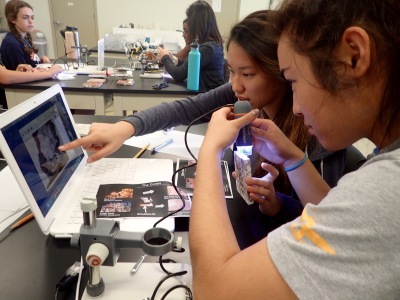 Gates Lab PhD student, Shayle Matsuda, visited the California Academy of Science to present a workshop to students in the Careers in Science internship program. 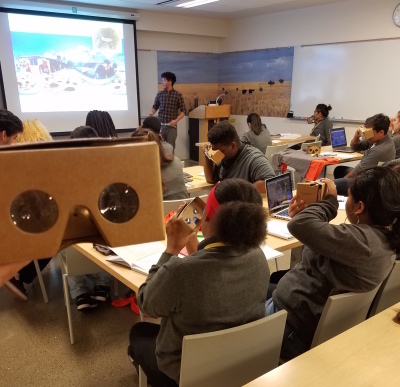 He used virtual reality technology to guide the students through a coral survey activity and help them explore the reef in the classroom! 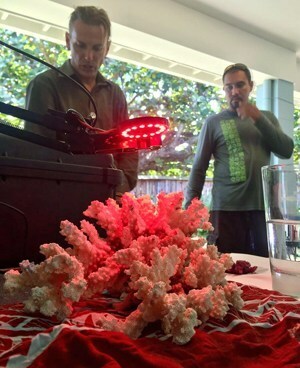 Chris also mentored a student for their science fair project at the Mid Pacific Institute on the role of exposure duration of sunscreen effects on corals. Congratulations on making it to the district science fair! 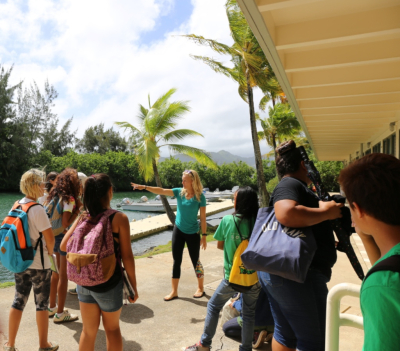 Gates Lab PhD student, Ariana Huffmyer, visited Nanakuli High School as a guest speaker in five marine science classes. 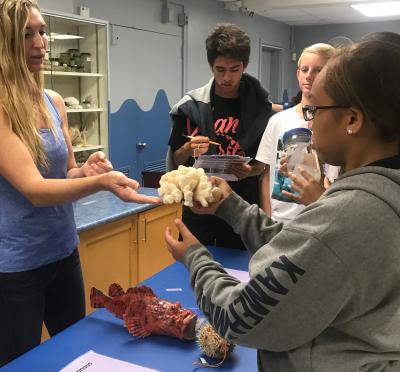 The students talked with Ariana about their backyard coral reefs and had the chance to look at juvenile and adult corals under the microscope! Thank you Nanakuli High School for hosting this visit. 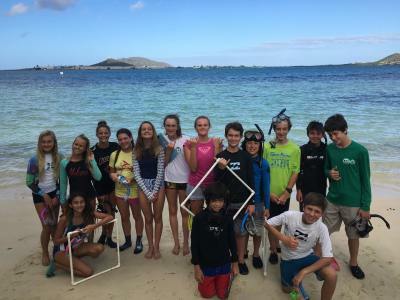 Students from the School for Examining Essential Questions of Sustainability on Oahu, Hawaii visited the Gates Lab to learn about coral reefs and conservation-based research. 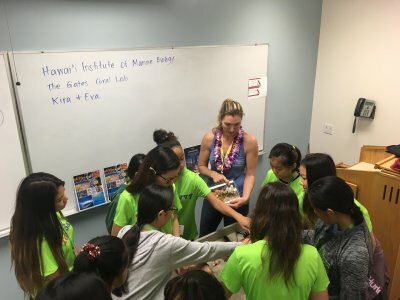 PhD candidate Chris Wall and PhD students Beth Lenz, Shayle Matsuda, and Ariana Huffmyer led the students on an interactive tour of the Hawaii Institute of Marine Biology and the Gates Lab. Thanks for visiting the Gates Lab, SEEQers! 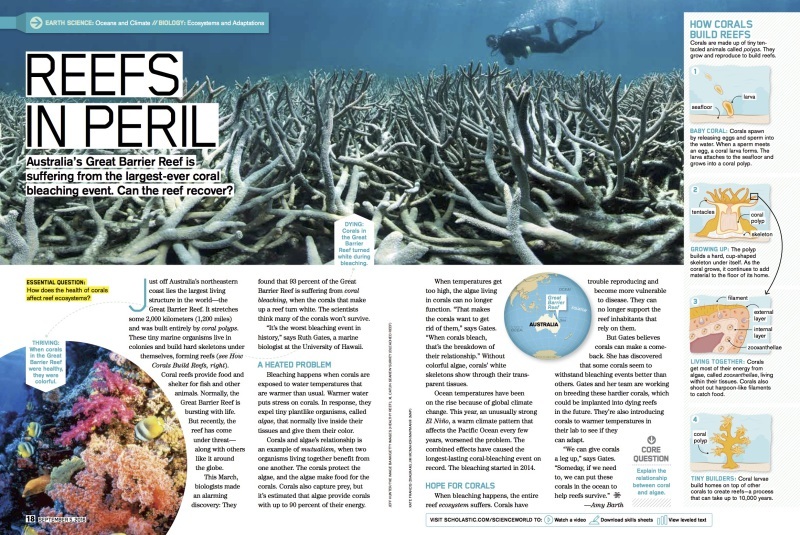 In a collaboration with Scholastic Magazines, Dr. Ruth Gates and others have worked together to publish an article about coral bleaching in the Scholastic magazine, Science World. ScienceWorld is an educational magazine for students grades 6-10. Look for another coral bleaching article in a future issue of Super Science for elementary students! 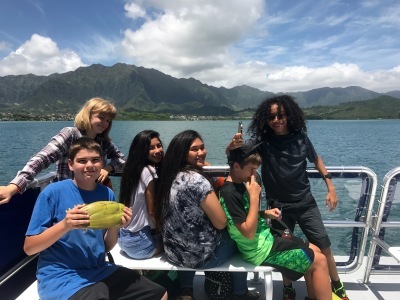 PhD Candidate, Chris Wall, gave a lecture on climate change and coral reefs to a group of young students from North Lake College (Irving, TX) participating in the Hawaiian Field Studies Program. This immersive biology and environmental science program visits three of the Hawaiian Islands to learn about the unique diversity found in Hawai'i; Chris was once a student of this program over a decade ago! 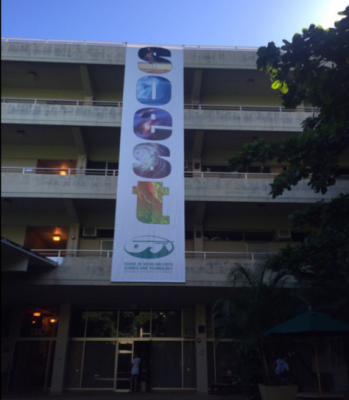 Gates Lab collaborator, Dr. Ouida Meier, coordinated an EarthCube CRESCYNT (Coral Reef Science and Cyperinfrastructure Network) Cyber Tools and Resources workshop at the 2016 International Coral Reef Symposium in Honolulu, HI. For more information about CRESCYNT and advances in cyberinfrastructure for coral reef science, visit earthcube.org/group/crescynt-coral-reef-science-cyberinfrastructure-network. 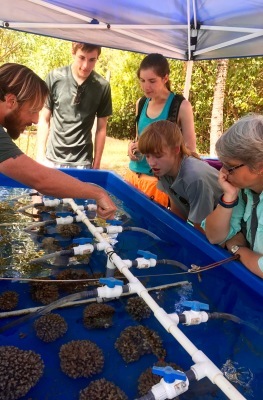 Gates Lab PhD Candidate, Chris Wall, is mentoring Sami Thomas from Coppell High School in Coppell, TX, in her International Baccalaureate Diploma on the local and global stressors on corals. Sami will be graduating in 2017 and will start her undergraduate at the University of Hawai'i. He also served as a science advisor for Ann Pace, a Sloan Finalist for Production from the Univ. of California Los Angeles School for Theater, Film, and Television in her ‘coral bleaching film’ script. Ann worked to write an inspiring script about coral bleaching in Hawai'i a scientist's quest to secure the future of coral reefs. 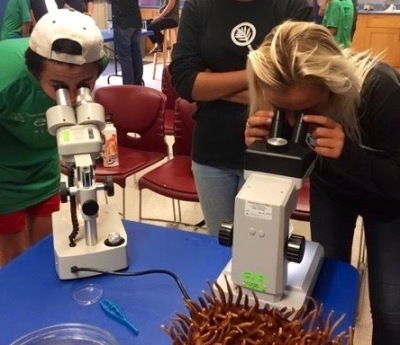 Gates Lab members Beth Lenz and Ariana Huffmyer held a workshop on coral reefs and reef management at the 2016 Expanding Your Horizons Girls in Science Conference. 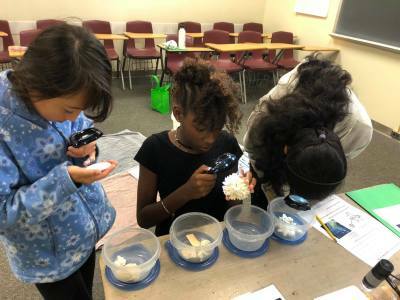 Middle school girls interested in science careers practiced monitoring their own coral reef! For more information on the Expanding Your Horizons Conference, visit http://www.eyhn.org/. The Gates and Lemus Labs partnered to welcome a motivated group of local educators in the University of Hawaii at Manoa EDCS 433 Interdisciplinary Science Curriculum course and their professor, Dr. Pauline Chinn, to HIMB to learn more about "Hawaiian Corals: Challenges and Opportunities". 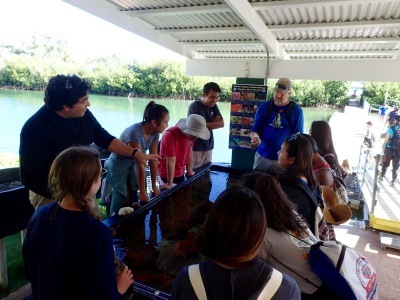 Dr. Judy Lemus, an academic program specialist at HIMB, Gates/Lemus PhD student, Ariana Huffmyer, and members of the Gates Lab spent a day with the educators talking about place-based marine science and engaging in hands-on and minds-on activities. We enjoyed a day of great conversations and learning with this group! 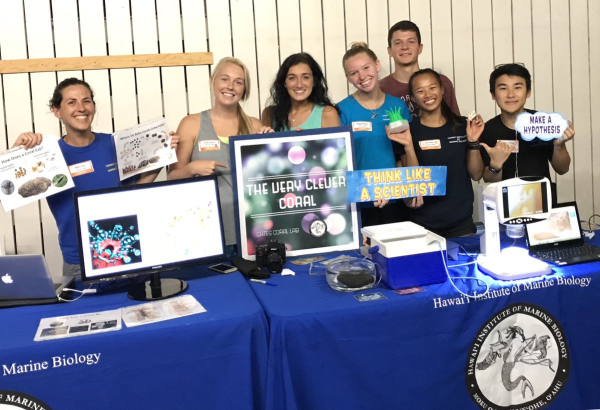 Gates Lab members teach the public about coral reproduction at the SOEST Open House at UH Mānoa.